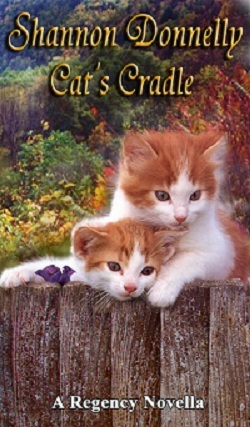 There’s a story behind every story–this one is about Cat’s Cradle, which is now available at Amazon for Kindle, BN.com for Nook, and at Smashwords. And I have to start this off by saying I’m partial to this story–ridiculously so, for a couple of reasons. The first reason is this is the first Regency novella that I wrote. That’s not to say this is the first short fiction I’d written. I’d actually cut my writing teeth on shorter works before I went after novels–in fact, I wasn’t sure I could write anything longer than fifty pages or so until I’d written a longer work. But I’m a believer that structure is structure. Meaning if you can structure a story, you can structure a story. The nice thing about starting off working in shorter form is that there’s no room for wandering. In a novel, you can put in side bits, you can mess around a bit, you can basically add fluff. You can get lost. In a novella or short story, every word counts, so they all have to be right. You have to keep your focus. And I love working within the restrictions that applied. The second reason this story holds a special place in my heart is that when I was asked if I’d like to do a kitten story, I knew I wanted the cats/kittens to be integral to the plot–they could not be stuck in there for window dressing (I hate that kind of story). With that in mind, I applied my theory of idea hunting–I went mining my past. Now, I’ve heard it said that some writer write about their own lives and some steal other people’s lives for their source. I’m not sure which group I fit into–I’ve done both. But I do find that mining my own past tends to make for stronger stories. And I’d had this cat. Most of time Stripey was the most timid of cats. She was the cat other cats chased–the weakling into whose face all felines kicked metaphorical sand. Until she had kittens. Then she became Stripey the Tiger, capital GRR. No one messed with her kittens–or her when she had kittens to look after. She also had one other habit. Her idea of the proper place to raise the kittens was in the garage. We had an old dresser in the garage and my dad stored his tools and bits and pieces there. Stripey also insisted on having her kittens in the bottom drawer, which wouldn’t close. No matter what kind of beautiful kitten basket we made her, the kittens came into the world in that dresser. We’d try putting the kittens into the basket for her. Soon, she’d be trotting back to the garage, one kitten at a time dangling from the hold she had on the scruff of their necks. Eventually, we gave way to her demand that the kittens spend their first few weeks in the garage–as I said, she was more than decisive with kittens in her charge. Stripey’s story became the story of “Bea” who insists on having her kittens in one place, even if that place proves inconvenient for her owner. And that became the catalyst (sorry about the pun) for the romance in the story. Of course, a cat alone a romance does not make. Meaning I needed a hero and heroine to go with the cat. Obviously, such a protective mother as Stripey needed an owner with the same inclination–like cat, like owner. And so the hero would have to pose a threat to my heroine’s offspring (but the husband would have to be out of the scene). Thankfully, my muse presented me with two very good candidates–Ash and Evelyn. This also gave me a chance to do a fresh take on the “proper spinster” (the heroine’s not actually a spinster), and the bad boy (Ash isn’t that bad, either, but he does have a past that’s not all that savory). One thing I’ve found with short stories or novellas–you have to limit the characters. Too many characters and you either cannot do justice to everyone or the story expands into a novel (that’s a tale for another day about Under the Kissing Bough and how that came to be written). But Evelyn needed boys–two youngsters, because it raised the stakes for her to have kids to look after. And Ash needed someone, too, because it’s no fun having the hero talk to himself or spend all his time brooding and thinking–besides, long-time servants are as good as family and families always cause the best additions of conflicts for characters. So that rounded out the cast to about six (including Bea, the cat–the kittens are a little too young to be more than “spear carrying” kittens). And there’s a couple of walk-ons, but a novella could handle that. And so Cat’s Cradle was written. It’s one of those blessing stories–it flowed from start to finish, and I loved writing every bit of it. I got to have fun, and to put in those little bits I love in a story. I don’t know that it’s one of my best works, but it’ll always be a special story for me. I’m more than delighted that it’s available again, now as an e-book.